That wasn’t the end of it, though. Robyn had met someone back in Bridgeport… ‘You must be Booker!’ Dylan smiled warmly (not that he had a choice in the matter in this heat) as he shook his sister’s partner’s hand. As Booker returned the handshake Dylan enviously noted his rippling muscles; his own physique had slipped a little since retiring from the fire service a few months ago. He wasn’t getting any younger, and his old injuries were hampering him a little. He’d decided it was better to bow out gracefully on a high rather than push himself too far again. ‘Indeed I am! And you must be the famous Dylan! Your sister never stops talking about you,’ Booker grinned back. Soon the pair were huddled over the flames, prodding and poking at the sizzling meat and deep in discussion about cooking temperatures and the pros and cons of gas-powered and charcoal-powered barbeques. Letting them get on with it, Louise and Robyn sat and soaked up the sun together. ‘What, getting drunk in the middle of the day?’ Louise teased, and the two women laughed at the memory. Robyn and Booker exchanged sideways glances at one another. ‘Oh, you tell them,’ Robyn said excitedly. ‘You heard, oh brother of mine! Booker proposed to me last week! It’s why we’re visiting, we wanted to tell you all in person… And so that Booker could actually meet his new family, of course!’ Robyn giggled as Dylan and Louise looked at each other in disbelief. ‘Bloody hell, Robbie! You sure know how to make an announcement, don’t you!’ Dylan held up his hotdog in a mock-toast in the absence of champagne. ‘Does your Mum know?’ Louise asked. ‘Oh Robyn, she’s going to be so thrilled for you!’ Dylan grinned as his phone started ringing in his pocket. Getting it out, he laughed as he saw the display. ‘Hah, speak of the devil! I bet she’s ringing for the gossip on Booker! Don’t worry, I won’t spoil anything,’ he chided his sister as he answered. ‘Mum! We were just talking about… What… Who is this? What? Where’s Mum? 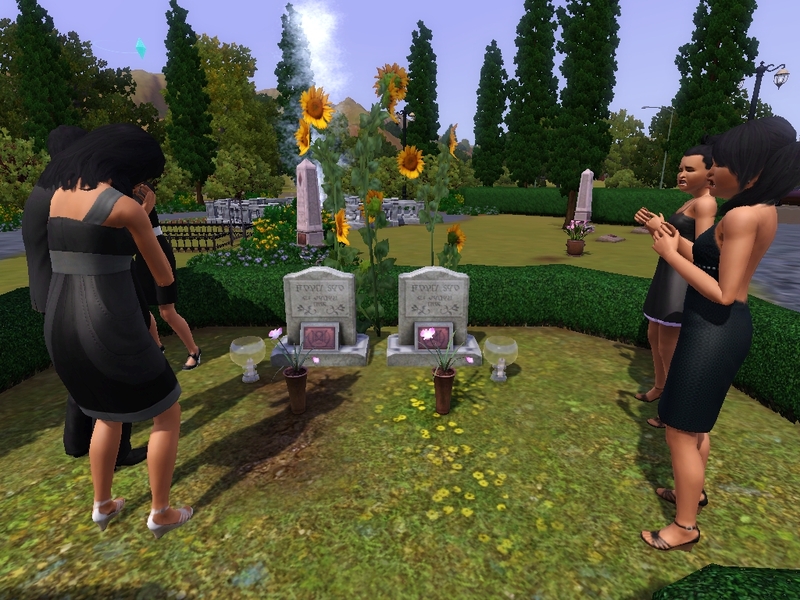 The following week was even hotter in Appaloosa Plains, but the Rivers family didn’t notice the sun beating down on them as they huddled around the pair of gravestones stood solemnly in the cemetery. Even the sunflowers, standing tall and proud, couldn’t brighten the scene up. Ivy Rivers had passed away at the grand age of 103. Her carer had found her sat in her chair clutching an old photo album, open on a picture of her and Ethan on their wedding day. A ghost of a smile was on her face. Dylan was a little comforted by this, but it didn’t stop the tears flowing. A few weeks later and it was time for Dylan to crack his suit out once again. 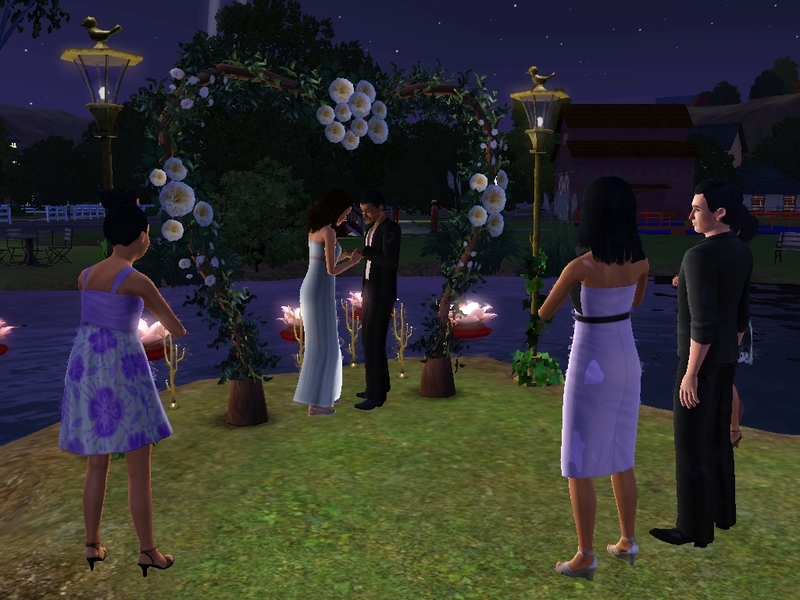 Robyn and Booker had never intended on a long engagement as it was, but after Ivy’s death Robbie was determined to get married in Appaloosa Plains. ‘I need my Mum there, Booker, in spirit if nothing else.’ The two had a private ceremony at Verde Park, which they had closed off for the evening. In spite of everything, it was a beautiful wedding. ‘Oh Robbie… You’ve made me the happiest man alive!’ Booker exclaimed soppily as the ceremony drew to a close. Robyn laughed, tears of joy streaming down her cheeks. 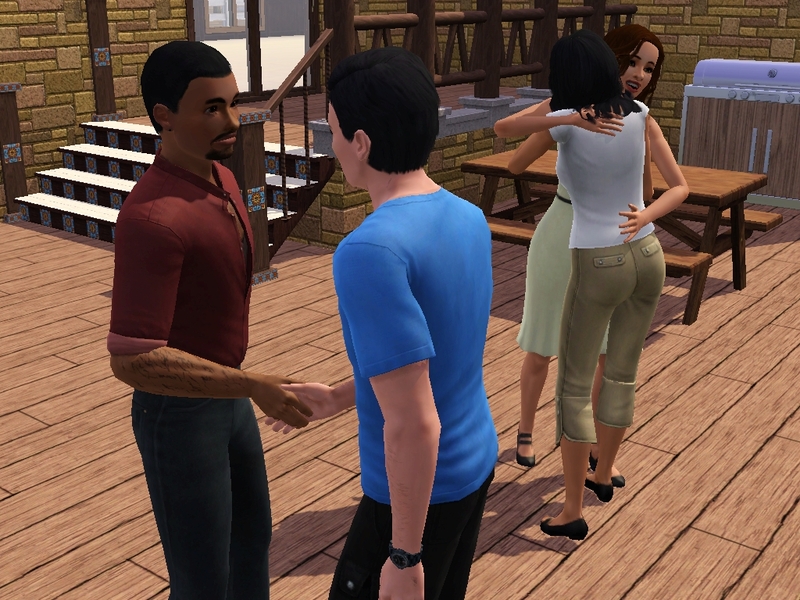 As Booker started talking to the twins, Robyn went over to her brother and enveloped him in a huge hug. ‘I’m so proud of you Robbie,’ he whispered. He knew all too well what she’d just been through. A refreshing breeze suddenly swept gently through the park, gently rustling the parched leaves of the trees and carrying the scent of the flowers to their noses. It was the first anyone had felt that summer. ‘I think she was here, Robyn!’ Dylan winked at his sister. Well, I’m super glad you made a new chapter! It’s fantastic, once again my writing skills are not nearly as good as yours. Nice plot twist by the way, I would’ve never figured that out. By the way, where did you get the china heart footprint/handprint thing? And did you get University? Yes! I did get University and it’s contents will be making an appearance on the blog in a couple of chapters time 😉 The china heart came with Generations I do believe 🙂 Thanks for reading!! Poor Lily 😦 and Freya. I do think that her family should have spent more time with her, even if she was mor difficult. I’m really suprised that Finley was gay, to be honest it’s quite mean to ask a girl to prom without telling her. It’s really good about Freyas book even if she was a bit harsh on Louise. It’s really good that Robyn found her true love 🙂 But not Ivy 😦 I loved ivy, I don’t want her to be dead! I see it as Finlay just figured that Lily knew as they were so close and he’d never actually made a move on her – friend intuition, if that makes sense! He never knew that she had feelings for him. It’s good to see you posting again, great update. It’s good to see Robyn back and happy. However it was unfortunate Ivy passed on before the wedding. I’m happy that Freya got published and even though she was a bit harsh to Louise, it probably will help open her parents eyes a bit more and see that they need to pay more attention to her before it’s too late. Freya has had it tough, I feel for her. I also would have never ever guessed that Finlay was gay, I just sat there all shocked for a minute or two. I felt bad for Lily because I honestly thought he had feelings for her, poor Lily. This chapter was beautifully written, it’s so sad that Ivy passed away but she did good to last to 103! Great news for Robbie, I’m so glad she found someone as nice as Booker. Such a shame Ivy couldn’t be there on her special day although I agree with Dylan that she was there in spirit. Poor Louise to feel like she’s a bad mother:( Freya was pretty harsh with her. I hope they can sort things out. I had a feeling Finlay was gay, I hope Lily can see past it and still be friends with him. This is such a sad chapter, but I’m trying to see the (hopefully) silver lining. Ivy is with her husband now while her daughter, Robbie, is happily married to a great guy. Dylan and Louise can now begin to repair their relationship with Freya, now that they know how broken it is and Freya has something to be really proud of. Finally, Lily’s going to be OK, Finlay didn’t really string her along and it’s just heartache #1 in a young girl’s life. Aw, poor Lily! Had something similar happen to me way back in the day. I took it better than she did, though, haha. 😀 So sad about Ivy dying right before Robyn’s wedding. 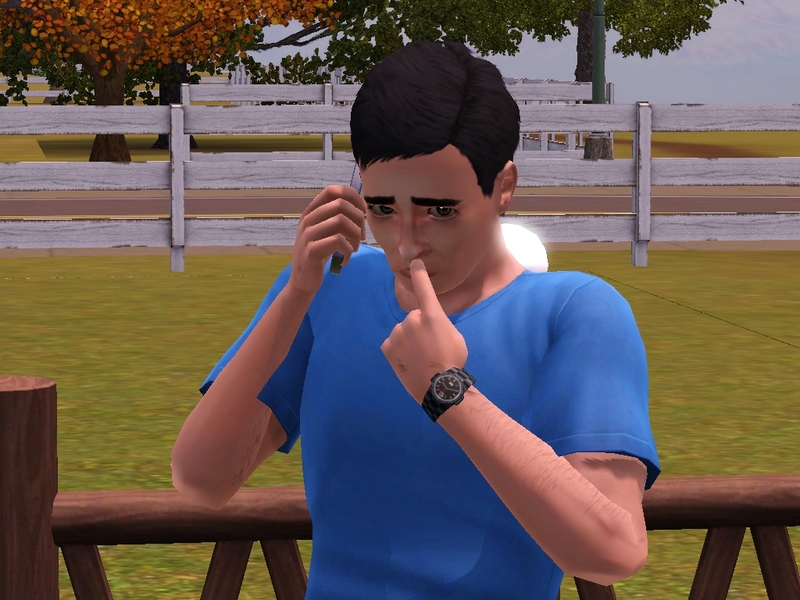 Sims always seem to pick the worst times to croak, don’t they? 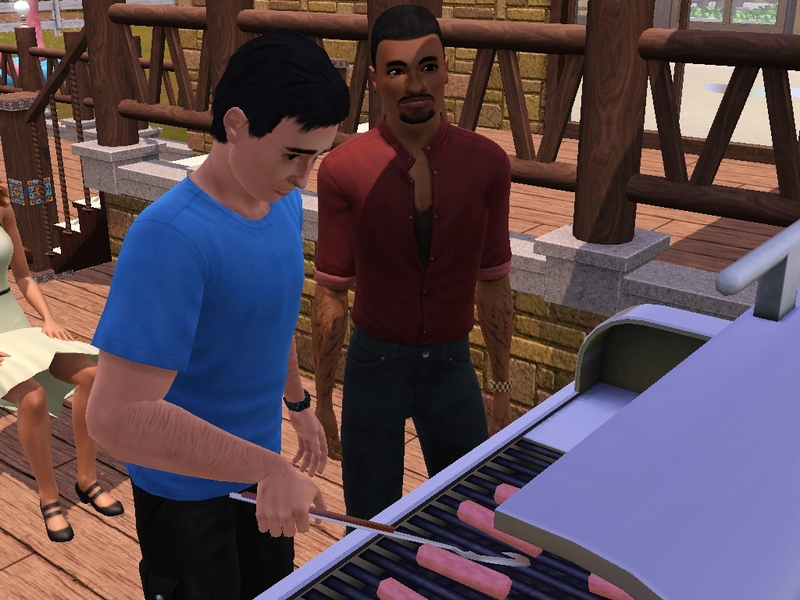 I laughed at Dylan and Booker having a manly bonding session over the BBQ. Reminded me of my dad and uncles, haha! Hopefully Louise can find a way to connect with Freya. She’s not that bad of a kid. I mean, she sneaks out after curfew to go read. There are much worse things she could be getting up to! They really do die at the worst times, I’m so fed up of having every special event marred with death. Hoping it doesn’t happen again for a long time! Thanks so much for reading 🙂 I do appreciate it. Good to see you back, Ashleigh! These last few weeks I’ve been reading your legacy and now that I’m finally caught up I’m sad there’s not any more chapters left to read! Anyway, I love what you do. This is probably my favourite legacy by now. You go, girl. Oh wow, thank you so much! I’m so pleased you enjoy my legacy so much 🙂 Really appreciate you taking the time to sit and read it all too, there’s a fair bit to get through! I can go on a bit 😉 I posted again today, so I hope you read and enjoy the new chapter too. Thanks again! Finally caught up! I’m relieved Dylan didn’t get too far ahead of me, and recovered from that fire-scare, but my what an ordeal the family seems to be going through! Shame that Ivy has passed, she was a wonderful character. Robyn and Booker seem to be a good match though, I hope we get to hear more from them now and then (and babies! They should have lots of those!). I really love the twins’ contrasting characters, and that they both have their fair share of teenage troubles, but I must admit Freya is my favourite of the two. Genuinely so thrilled to see you back Tipix! It’s been such a long time 🙂 Thank you so much for taking the time to catch up with my legacy, it means a lot. Off to catch up with the Chouettes now! Very excited to get stuck in again!! Thrilled to be back, and to have caught up – the Rivers are just as fun to read about as the Emmetts!